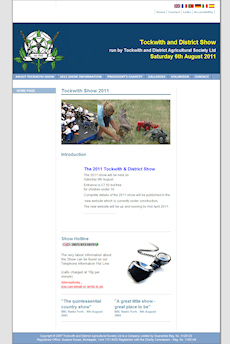 The organisers of Tockwith Show, a country show in North Yorkshire, asked Toby Wallis Communications to review and redesign their website and other visual identity elements. As the Show is supported largely by volunteers it was important to ensure that the website can be updated by section very easily, so responsibility for different parts of the site can be allocated/re-allocated in response to personnel changes. At the same time, the overall design must be robust as well as attractive so that any changes/additions to the website retain the appropriate design identity. In order to meet these requirements it was decided to built the new website on the WordPress™ platform. This has the added advantage of a very quick deployment cycle, so the whole site was up and running in just a few weeks. 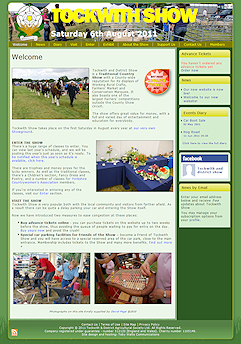 The new website went live on Easter Saturday, 23rd April. Innovative features include online advance ticket sales, News by Email, a Facebook page, interactive maps and more. Plans are currently being laid for the publication of results, with the aim of these appearing on the website as soon as they are announced at the Show.